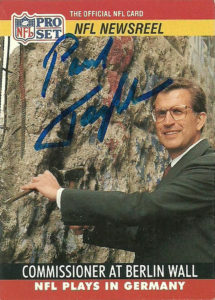 Taking the reins in 1989, Paul Tagliabue faced a very tall order: Following up the near canonization of previous commissioner Pete Rozelle. Paul steadied the boat of the league on numerous occasions, handling Raiders owner Al Davis in his on off love affair with Oakland, the Rams move from LA to St. Louis, the Oilers from Houston to Tennessee, and the Browns from Cleveland to Baltimore. During each occasion he addressed each relocation publicly to keep the league from getting a public black eye from ‘stadium blackmail’. Tags also presided over unprecedented expansion. After the league got slammed publicly from the middle of the night departure of the Browns, the NFL gave the city back the franchise, name, and records. He also saw the league expand to Charlotte, Jacksonville, and back into Houston. 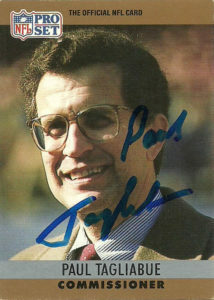 Paul also oversaw the league’s bold plans to export international play of the sport into Europe and elsewhere in the world, culminating in the WLAF/NFLE/ NFL Europe, that he briefly served as commissioner of in addition to his NFL duties. Tags and his team navigated the deep waters of the 1993 bargaining agreement without a strike occurring. This brought about a salary cap, the end of Plan B free agency, an increase to the overall wages of all players in the league, and unfettered growth of the league. In the meantime the league created a feeding frenzy from the networks for their programming, allowing the league to return record profits. Paul also took the high road on the state of Arizona, as when the state refused to honor MLK Day, the league pulled up its tentpoles for the Super Bowl and went to Pasadena. Tags also made every attempt to help keep the Saints in New Orleans after the tragedy of Hurricane Katrina in 2005. He served 17 prolific years for the league, creating a hand in hand workmanlike relationship between players and the league. He even briefly came back to serve as an arbitrator in a recent NFL case with the Saints, but despite all this, many players, media, and fans, remember him for his handling of the severity of concussions which really hinders his legacy. Eventually I believe the league will vote Paul into the Pro Football Hall of Fame, and deservedly so, but at this time he remains too much of a hot button of a candidate for voters to choose.